Posted: Mon Feb 02, 2015 7:03 am Post subject: Do bees like moss? About three weeks ago we started noticing bees going to a mossy patch under the willow tree. I shot some video of it in the hopes someone would know how the bees are benefiting from it. I'm interested in shooting sharper macro videos. If anyone can suggest a fast macro lens they're happy with, please don't hesitate to tell me. Posted: Mon Feb 02, 2015 8:40 am Post subject: Re: Do bees like moss? Collecting water would be my call (video won't load for me). Way back in the 'old days' my grandfather used to cut motorcycle tires longitudinally and then stuff each half with moss before topping up with water. Worked really well for the purpose. Bees don't like moss - they love moss. Moss is the favorit of the bees. All my bee watering places have moss. Interesting enough, there is a lot of microbial activity and life in a patch of moss. Good for humus production. Maybe that is another factor why moss is a favourite for the bees? I'm guessing they are collecting water, with some nutrients they can't get from pollen or nectar, and perhaps fungi and yeasts - there's a PhD in there for somebody! This is an interesting topic for me. Moss has steadily been taking over my garden since I got my bees. Like the rest of the landscape around me, it appears that it is another plant that bees love that is flourishing. Are my bees gardening it? The "lawn" in front of my hives is just about devoid of grass and has an incredible number of different and quite unusual looking moss and lichen. An Environment Agency officer who was visiting over another matter noticed and made comment about it last summer. So my question is, have my bees encouraged these mosses to thrive as they have with so many other plants and trees. 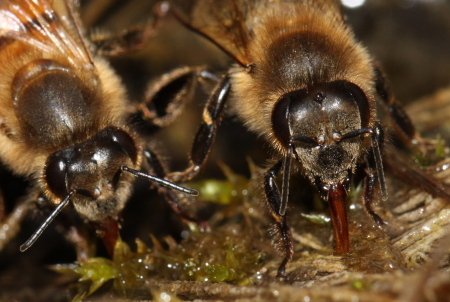 Is moss bee pollinated or does it perhaps thrive on bee poop? The interesting thing is that there is quite green grass directly in front of the hive with a lot of white clover and then the moss and lichen starts about 10 feet away and the patch stretches for about 20-30 feet and then the grass is thick and green again. This lawn is quite well drained so it's not the really moist green stuff you see bees collecting water from, but more crinkly lichen type moss. 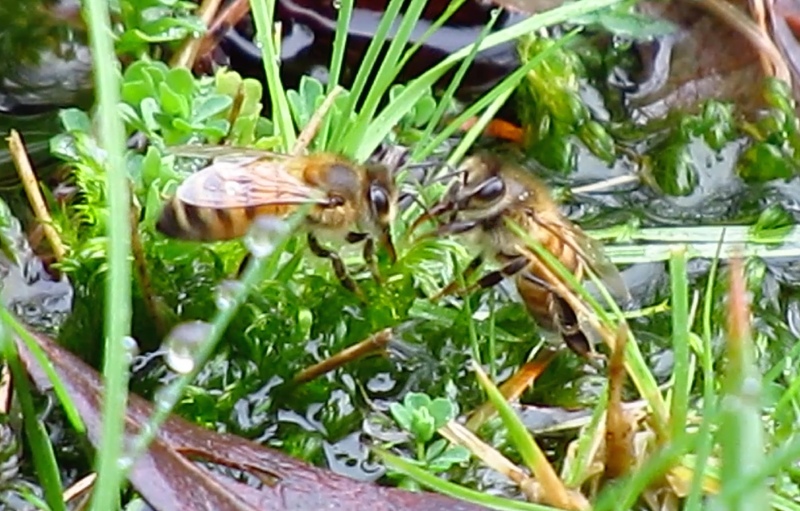 I have other damp lawns where the velvet green stuff grows although the bees predominantly use the muddy banks of the adjacent stream for water. Interestingly horses tail which usually likes damp conditions also flourishes in the patch of land. Does anyone have any ideas or notice similar development of moss. Could the bees poop be burning off the grass and allowing the moss/lichen to take over? Most of the hives face roughly in this direction and it is more or less directly south of the hives. Posted: Tue Feb 03, 2015 3:56 am Post subject: Re: Do bees like moss? He would do this to provide water for the bees? So my question is, have my bees encouraged these mosses to thrive as they have with so many other plants and trees. 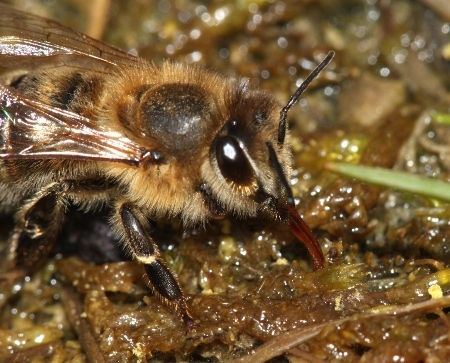 Is moss bee pollinated or does it perhaps thrive on bee poop? The interesting thing is that there is quite green grass directly in front of the hive with a lot of white clover and then the moss and lichen starts about 10 feet away and the patch stretches for about 20-30 feet and then the grass is thick and green again. Yes, very interesting. We need some biologists weighing in, and like Phil says, "there's a PhD in there for somebody!" Beautiful shots as always, Bernhard. Do you think the bees will use the moss microbial properties as part of their propolis? Moderator, feel free to remove if it doesn't. That didn't work...I'll try again. 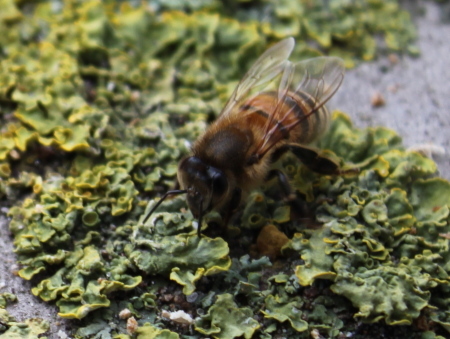 Posted: Tue Feb 03, 2015 8:33 am Post subject: Re: Do bees like moss? Yes. IF there's a need to provide drinkers for any reason those tires are very good for the job. Thanks, Luc P. I see that button now. I might try it if I can find another good photo. 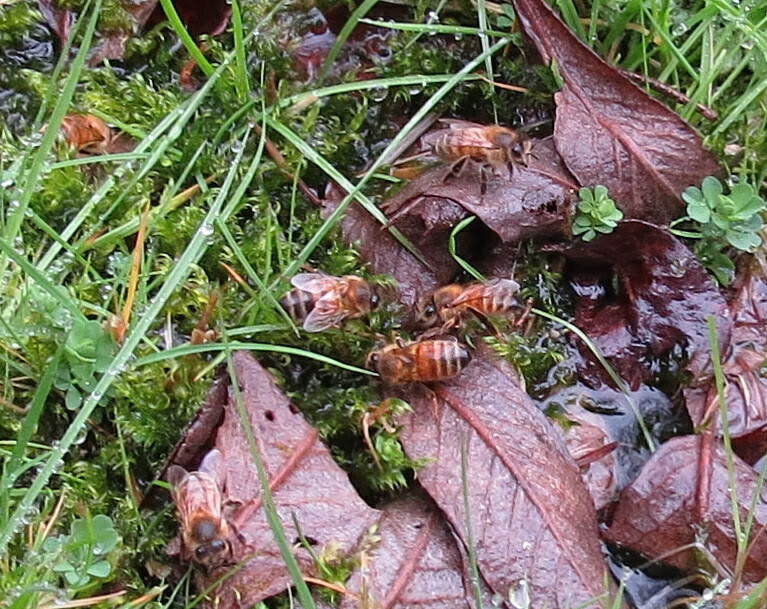 It was raining most of the day today, but the bees were still circling around the area. The water was deeper, but they still found some places to land. Great pics of the bees what camera and lens were you using curious. My bees are very keen on the mossy surface of the soil in my pots of carnivorous plants. The soil is mainly peat, typical of what carnivorous plants grow in, and I keep them stood in rainwater - result is lots of soggy moss for the bees to collect water. A few manage to fall into the water beneath the pots - I've tried to make ramps to help them climb out. And perhaps some indeterminate number fall victim to the plants themselves - well they _are_ carnivorous. The plants are Sarracenia, Darlingtonia, and Dionaea - all stay outside all year - the hardiness surprises me (especially the latter - common name Venus' Flytrap - which most people grow indoors). I'd like to get sharper videos though. I just watched some of Thomas Shahan macro photograpy and it's, well, pretty awesome...something to set as a goal. The video link to utube does not work is it set to private. I just checked it...it's set to public. It's the same link as the first one in the opening comment. Sorry it doesn't work for you. I'm not sure how to fix it. 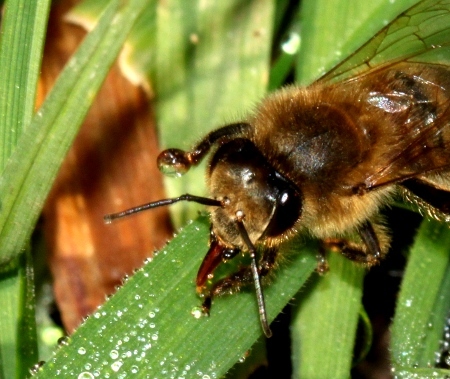 Is moss bee pollinated or does it perhaps thrive on bee poop? From what I understand moss and lichen reproduce by spores, which I would guess could easily bee spread on the legs and bodies of bees. And maybe even passed through their digestion if they drink water off the moss and deposited in their poop. I also believe mosses produce acidic conditions so the bees may be seeking it out to balance PH if other water sources are alkaline, as well as the microbes it contains. Plant reproduction is a fascinating subject and a little reading will give rise to the topic of the 'alternation of generations'. I did it on a cold day, so the bees were in their hives, but I've two more trays of pots to do yet - at this rate, I'll have to move the trays elsewhere during the night, then repot the next day, otherwise I'll probably be stung by drinking bees (not that they'd aim to sting me, put I'd almost certainly pick up a pot without spotting a bee on it). I've put the moss I removed in a very large plant-saucer, with rain-water to keep it wet, and put it in the 'enclosure' with the two bee-hives. So far, no interest from the bees whatsoever! I wish they'd take to it, rather than flying across the garden to the carnivorous plants. I also need to do the 'annual-maintenance' on the pitcher plants (Sarracenia and Darlingtonia) - maybe don't need to remove the moss from these this year, but at least want to cut off dead leaves to make them look nice. Again I'll have to seize any opportunity when the bees aren't drinking.